The team has been in existence now for the last 8 years and this is will be our fifth appearance at the Buxton Military Tattoo. It is this event that gave the team national recognition for excellence and is the only Air Cadet Squadron authorised by the RAF to perform in public. Since appearing at Buxton, the team have had many engagements at public shows and military bases but always look forward to the return to where it all started. Their largest audience to date was performing at the Birmingham International Tattoo in front of ten thousand people. They have been lucky to perform alongside the Queens Colour Squadron and the Norwegian Royal Guard. 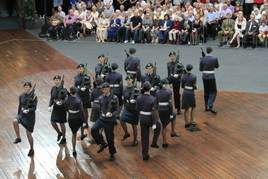 The display team is made up of 22 cadets, aged between 14 and 19 years of age with 16 cadets forming the team for the actual display. Cadets apply to join the team and are selected based on their smartness and drill performance.